Mission San Rafael Arcángel, twentieth in the California Mission Chain, was founded on December 14, 1817 by Father Vicente de Sarria and named Saint Raphael the Archangel, patron of good health. The mission was initially established as a convalescent hospital for the ailing Native Americans converts living at the nearby Mission San Francisco de Asis (Mission Dolores). The cold and damp climate of the area where Mission Dolores had been built sickened the converted Indians, thus the Spanish Fathers decided to build the San Rafael Arcángel medical "asistencia" in the North Bay. There, the weather conditions were more favorable than in the San Francisco area. Despite the site was never intended to become a mission, thanks to the work of the converted Indians, the convalescent hospital grew so well that on October 19, 1822, it was granted the Status of Mission. The growing presence of Russians in the nearby Bodega Bay also played a key role in granting the full Mission Status to the San Rafael Arcángel Hospital. At first, the Russian presence in the Bodega Bay was limited to a seasonal settlement mainly used by fur traders seeking otters and seals. Later on, the settlement became a stable outpost known as "Fort Ross" and was used by the Russians as an agricultural base to supply with food their northern settlements. The Spaniards envisaged that the establishment of a Mission Community in the San Francisco North Bay Area would have been the best way of preventing the Russians from further expanding towards the South. Mission San Francisco Solano, the northernmost of all California Missions and the last in the Mission Chain, was built for the same purpose. At first, the founding Father, Vicente de Sarria, lived in the medical "asistencia" together with over two hundred converted Native Americans and three others Franciscan Friars: Abella, Duran and Taboadaover. The original adobe church was built in 1818 but after a short-lived existence, the church and the other surrounding buildings began to disintegrate. San Rafael Arcángel was one of the first missions to be secularized and in 1833, it was turned over to the Mexican government. In 1840, over one hundred Indians still lived at Mission San Rafael Arcángel but by 1844, the Mission had been completely abandoned. The remaining ruins and the few parts of buildings still standing were stripped of their wood. 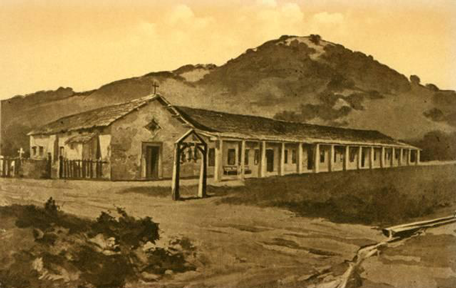 In 1855, San Rafael Arcángel Mission was returned to the Catholic Church. From 1861 to 1870, the ruins of the Mission were torn down and replaced by a new parish church. Today, all traces of the early buildings have been lost and all that is left of the original Mission is a single pear tree from the old Mission's orchard. For this reason, Mission San Rafael Arcángel is known as the "most obliterated of California's missions". On December 18, 1949, a replica of the original mission church with a simple doorway under a star window was dedicated. Just outside the door, a mission bell hangs from a wooden frame. San Rafael Arcángel Mission is open to visitors and has a gift shop and a small museum, the latter containing three of the original mission bells.